Join us this Thursday for White Haute Nights at Tabbuli showcasing Sam’s Closet. White Haute Nights are Back! White Haute Nights are back at Tabbuli! People go to Tabbuli for its trendy style along with the best Mediterranean food and award winning cocktails in Charleston. Couple that with a fashion show and you have a recipe for success. Models will be showing off the latest fashion from local boutiques and designers while you dine. This is South Beach style in a big way! Tabbuli is proud to host an event with fashions by local boutique “HOUSE OF SAGE”, sponsored by Charleston Fashion Week, with all proceeds benefit Teachers’ Closet. We welcome all patrons to bring supplies supporting the efforts of Teachers Closet. Please visit Teachers’ Closet’s website for a list of approved donations. 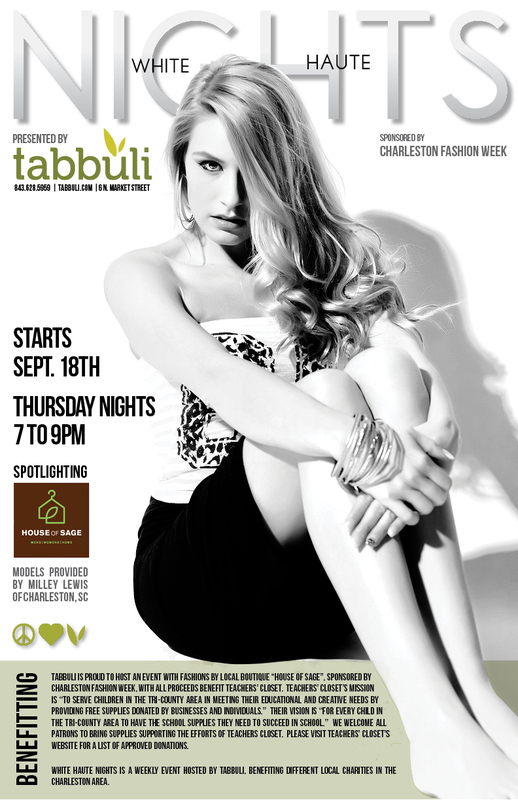 WHITE HAUTE NIGHTS is a weekly event hosted by Tabbuli, benefiting different local charities in the Charleston area. Check out the pictures from the first event on Thursday September 18th!